HOUSTON – Germany-based Union Investment announced it has finalized the purchase of the 36-story 1000 Main office tower in downtown Houston for approximately $440 million or about $525 per square foot, in one of the biggest Houston realty deals ever. “We are delighted to add this well positioned property with strong prospects for stable long-term income and rent growth to our excellent US portfolio,” said Martin Brühl, head of International Investment Management at Union Investment. Union, which is based in Hamburg, acquired the 836,000-square-foot building for its Unilmmo: Europa fund. Union was advised by Metzler Real Estate, which has strong ties to German investors. After making plays in Austin and Minneapolis, Union has now entered a third US market outside of the traditional East and West coast investment regions in just 20 months. In a statement, Union noted that Houston is called the “Energy Capital of the World” and is the fasting growing city in the United States. The seller of the Houston tower, Invesco Real Estate of Dallas purchased the 1000 Main building in 2012 for $355 million. Ron Miller, senior director/acquisitions specialist for Invesco said the building had exceeded Invesco’s expectations as an investment vehicle. Speaking at the RealShare Houston event Tuesday, Miller said Invesco devised a strategy about four years ago to purchase Houston real estate because of the surge in the energy industry and domestic exploration. 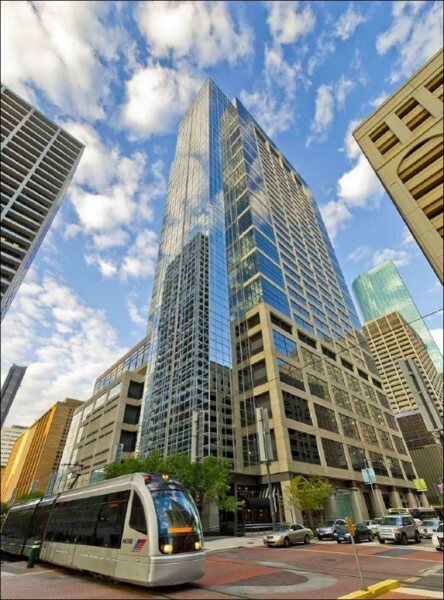 So in 2013 Invesco bought the 64-story Williams Tower for $412 million and the 1 million-square-foot BG Group Place for a reported $480 million – in addition to adding 1000 Main to its portfolio of Houston trophies. Bernard Branca, senior vice president in CBRE’s Houston office, marketed the 1000 Main building, which was formerly known as Reliant Energy Plaza. The tower, which is 99 percent leased, was developed by Richard Everett of Century Development. Last year, Invesco was on the verge of selling 1000 Main to LaSalle Investment for $450 million ($537 per SF) for the 1000 Main building in downtown Houston – a price which would have been the highest ever paid in Houston on a per square foot basis. But LaSalle withdrew from the deal late last year in the wake of falling oil prices, according to Real Estate Alert. Seattle-based Metzler frequently works with German investors, including Union. Metzler Real Estate was founded by the Bankhaus Metzler organization which traces its root in German banking back to 1674. The 1000 Main building is located on the Main Street Square METRO stop on a block bordered by Main, McKinney, Travis and Lamar. Invesco’s Miller was speaking at the RealShare conference at the Houstonian Hotel. RealShare is presented by ALM Real Estate Media Group and GlobeSt.com. Houston-based Realty News Report was a media sponsor of the event.